Nanotechnology affects every aspect of the health sciences. There are now such subject areas as Nanobiotechnology and DNA Nanotechnology. Engineered vaccines contain proteins with nanoscale dimensions. Here we'll focus on the broader classification of nanomedicine which includes examples of nanopharmaceutials. Nanopharmaceuticals and nanomedicine are vast areas of expertise which are developing at an impressive rate. Here are some of the major advances which nanotechnology has brought to these fields. Metal nanoparticles, carbon nanotubes, polymers can be used in different ways in medicine especially when combined with antigen-specific coatings or functional groups on their surfaces. Their size, physical properties and chemical composition determine their usefulness. The small size of these structures lends itself to their use and ease of circulation but they mustn’t get lodged in capillaries and other microanatomies. Nanoparticles have been used as contrast and image enhancing agents for x-ray and computed tomography (imaging via any kind of penetrating wave) imaging (CT). Conventional methods of imaging use iodinated benzoic acid derivatives but these have risk factors and side effects associated with intravenous iodine injection. These derivatives are of low molecular weight so clear from the body rapidly and are difficult to direct to disease sites. Iodinated molecules have been encapsulated to overcome these problems but stability and concentration of agent delivered to imaged site is low. In order to enhance an X-ray image an agent must deliver detectable numbers of heavy atoms into the imaged tissue without toxic effects. Suitable nanoparticles are those made of elemental heavy metals such as gold as these have high densities and are still biologically inert and stable. To overcome the cost issue associated with gold researchers at General Electric developed nanoparticles made of heavy metal compounds encapsulated in gold shells. By adding thiol groups gold nanoparticles can be coated with selectively binding antigens, antibodies or target compounds for receptor on the surfaces of cells. By targeting receptors unique to certain types of cancer cells, gold nanoparticles can be made to enhance an x-ray image by increasing the ability to detect the the cancer cells by many orders of magnitude. Metal and Silicon Nanoparticles can be used to enhance Magnetic Resonance Imaging (MRI). Silicon Particles fabricated into shapes and coated with conductive layers have enhanced magnetic resonance interactions. Nano-engineered particles could enhance the visibility of many biomedical devices, both implantable and interventional, that today are difficult to image due to problems that interfere with magnetic fields and hence MRI. Nanoparticles can be also used to reduce interference of pacemakers, defibrillators, neuro-stimulators, guidewires, endoscopes and other devices with MRI fields, allowing their impeded use with MRI. Nanoshell particles with optical resonances in the IR region have been used to enhance imaging of cancer cells. Work on this type of nanoshell for cancer treatment is being carried out by research groups at Rice and Arizona universities. (Upper left) Gold nanoparticle with ligand shell showing protective layer to isolate gold from physiological interactions and highly soluble, biocompatible outer layer. (Lower left) High-resolution microCT with AuroVist™-15 nm: blood vessels in a live mouse around legs and pelvic region after IV injection of AuroVist™-15 nm. 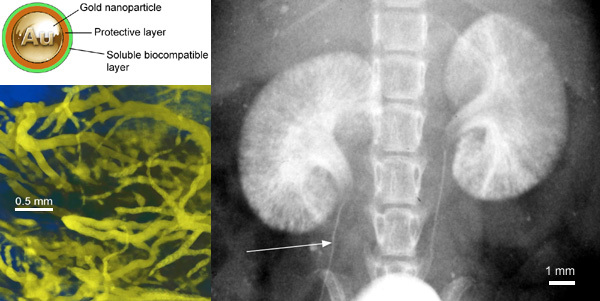 (Right) Kidney imaging, showing how clearance through the kidneys facilitates detailed imaging: Planar X-ray image of kidneys in live mouse after IV injection of AuroVist™-1.9 nm gold nanoparticles. Arrow: 100 µm ureter. In the journal Angewandte Chemie ("Phosphorescent Nanoscale Coordination Polymers as Contrast Agents for Optical Imaging"), a team led by Wenbin Lin at the University of North Carolina, Chapel Hill, USA, in March 2011 introduced a novel contrast agent that marks tumor cells in vitro. The dye is a phosphorescent ruthenium complex incorporated into nanoparticles of a metal–organic coordination polymer, which allows an extraordinarily high level of dye loading. sufficiently strong fluorescence. Organic dye molecules packed at high concentrations into nanocapsules tend to quench each other's fluorescence. Materials that fluoresce more strongly, such as quantum dots, are often not biocompatible. Nanoparticles can be filled with absorbed or encapsulated drugs and targeted onto cancer cells or disease agent. The aim is to deliver nanoparticles with concentrated anti-cancer drug straight to the tumour site without affecting healthy cells. Drug laden nanoparticles can be injected into tumours with procedures that are minimally invasive. Their effect can be enhanced by using drugs that are further activated by radiation. Some of these drugs may have problems getting to the tumour site due to physiochemical properties, including high toxicity, and so it helps for them to be embedded directly in to the tumour. When the encapsulated drug is embedded in the tumour the polymer and nanoparticle shell are degraded for the controlled release of the highly toxic chemotherapeutic drug into the tumour, without affecting other tissues. The video on the right describes this process in simple terms with good animations which help explain the concept. In the central nervous system epithelial cells lining the walls of blood vessels overlap in tight junctions, unlike those in the rest of the body. This closes off easy transport of large molecules (about 500DA molecular weight) between blood and brain. This helps protect the sensitive and vital central nervous system from disturbance by chemicals and pathogens (e.g. viruses). The barrier is lipophillic. To get past molecules must be small and lipophillic. Many of the drugs designed to treat diseases of the brain such as Alzheimer’s disease, Huntington’s disease, stroke and brain cancer depend on carrier-mediated transport and other such mechanisms to cross the blood brain barrier. The radio labelled Cu2+ or Fe3+ metal chelator clioquinol, which has a high affinity for plaque which is a factor in neurodegenerative disease, has been encapsulated in liposomes capable of crossing the blood brain barrier. The fact that some nanoparticles cross the blood brain barrier could be as much of a curse as it is a blessing. The blood brain barrier protects the brain from toxic chemicals that could damage it and the fact that nanomaterials can cross this barrier is a worry for some doctors. The main cause of Type I (insulin dependent) diabetes mellitus is degradation of insulin- producing cells in the Islets of Langerhans. Insulin must be injected to treat this disease because it is a peptide and will be broken down by digestive enzymes. There are risks of improper dosage and rates of release related to the administration route. Insulin needs to be released in controlled amounts. Inhalation routes of administration have been extensively investigated with regards to insulin delivery. The surface area of the human lungs is roughly the size of a tennis court so if insulin could be delivered to the capillaries and alveoli of the lung there is high potential for direct absorption into the bloodstream. Nanotechnology has much to contribute to solving lung diseases as well as for finding new effective inhalation drug delivery methods. Inhalation routes are an important and growing area of biomedical research in many ways besides diabetes and are likely to be an area where nanotechnology will make a large impact. The Nano Mist (patent number US60/918,662), is a smart drug that can constantly monitor a diabetic's glucose level and release insulin as the body needs it using liposome nanoencapsulation and glucose receptors. This is a model they built to represent the cross section of a 100nm liposome from their Nano Mist. Most work on transplanting encapsulated cells has been in the area of insulin- producing pancreatic beta cells. After years of having experiments that result in the implants being smothered by plaques and invaded by the immune system of the host, promising results are beginning to appear using new nanoengineered encapsulation materials and techniques. Encapsulation of pancreatic islets allows for transplantation in the absence of immune-suppression. might replace today's conventional treatments like organ transplants or artificial implants. Advanced forms of tissue engineering may lead to life extension.The area of nanoguides for neural growth and repair is a very diverse and complicated area of research in which a lot of work is being done. Neural interfaces to nano- and micro- electronic devices open new opportunities to design more powerful neurostimulators for prosthetics. These little devices could quite possibly be the most widely useful piece of equipment which nanotechnology has allowed scientists to create. At the moment in doctors surgerys everywhere patients are giving blood samples and are then sent away to wait for results for a few days. Labs-on-chips would eradicate this waiting period as they allow a tiny drop of blood to be tested immediately and results to be given there and then in the doctors surgery. 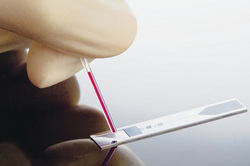 Some have already been created such as the one for diagnosing HIV. The advancement in nanotechnology has made it possible for you to have an entire medical lab reduced down to the size of a high-powered chip. Researchers are working hard towards creating a nano sized lab that performs a variety of tasks. These tasks signify conducting multiple diagnostic tests, which would take an entire team of doctors, at least, a week to provide results. The reason they have not been widely available yet is because of the cost issues. But in the long term it would seem costs would balance out with the money saved on not needing as many full-scale labs and analysts. The Guardian, in their article, “The incredible shrinking laboratory or lab-on-a-chip”, states that Professor Tom Duke of the London Centre of Nanotechnology is working on a “lab-on-a-chip” to test HIV. 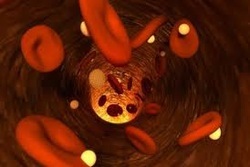 In this chip, nanometer-sized pillars separate a drop of blood in such a way that the larger elements such as blood cells and proteins are trapped. The virus particles then pass through this trap where the come across a series of levers that are coated with antibodies. These antibodies then tend to bend when hit. The more they bend indicates the amount of virus present. This is just one application that the lab-on-a-chip possess. There are many other features that are also present. The LOC will be of big benefit to developing countries where full-scale laboratories are not accessible. South African scientists from CSIR have incorporated traditional TB drugs into nanoparticles.Council for Scientific and Industrial Research (CSIR). The WHO estimates that approximately one-third of the global community is infected with M. tuberculosis. In 2006, an estimated 9.2 million incident cases and approximately 1.7 million deaths due to TB occurred worldwide making it the worlds leading causes of mortality. The safety and uptake of the nanoparticles is being tested in TB-infected mice and the effectiveness of the nanodrug is being compared to conventional therapy to see whether a weekly nano dose is as effective as the standard daily treatment regime. Human trials for the antibiotic, called Rifanano, are scheduled for this year. Diagnostics: The Central Scientific Instruments Organization of India designed a nanotechnology-based TB diagnostic kit, which is currently in the clinical trials phase. This kit does not require skilled technicians for use and offers portability, efficiency, user-friendliness and availability for less than US$1. The research is also ongoing for an optical biosensor for rapid TB detection in the Medical Sciences division of the U.S. Department of Energy. Another group at RMIT University, in Australia, is conducting research into the application of novel tethered nanoparticles as low-cost, colour based assays for TB diagnosis. have found better chemotherapeutic efficacy when investigated in animal models (e.g. mice). A new biomaterial designed for repairing damaged human tissue doesn't wrinkle up when it is stretched. The invention from nanoengineers at the University of California, San Diego marks a significant breakthrough in tissue engineering because it more closely mimics the properties of native human tissue. It's an endless list of ways in which nanotechnology is advancing medicine. Other areas such as robotic surgery and implantable sensors for blood pressure have also seen improvements. It's going to majorly affect, like all industries, communication devices, data storage, information displays and other instruments within the hospital.